My son, Kiama, and his friends walked to the water hole because they were thirsty. Kiama knelt at the edge and leaned down to get a drink, and that’s when he fell in. He friends tried to help, but no one knew how to swim. The stone was slippery. My son couldn’t climb out. The children ran for a mile to get help. I remember hearing my neighbor say, ‘A child has fallen into the water hole and drowned.’ We all ran as fast as we could – all silently praying that it was not our child. By the time we got there it was too late. The child in the water was dead. The child in the water was my son. We walk for hours, every day, to find water. It’s what we do. And the journey is difficult and dangerous. I share this story hoping that some positive change might come from my son’s death and from my grief. I have served as a medical volunteer for many years, and in most of the underserved areas of the world where I’ve been, water is a big problem. Nzara is part of South Sudan CHAMPS. It is a small town that is fortunate to have a few streams and rivers with water for the entire year, even during the dry season. However, the water is contaminated. Sadly, most families just don’t have the money to treat the water, so a lot of people get sick. Many infectious diseases – especially gastrointestinal issues that result in vomiting, diarrhea, and life-threatening dehydration – put young children, especially infants, at risk. In Nzara, CHAMPS works with the Camboni Sisters at the St. Teresa Hospital. The hospital compound is blessed with three good wells. With the support of CMMB and other partners, St. Teresa’s installed a solar-powered water pump. It’s amazing. The clean water from the wells is pumped into large tanks that supply the hospital and other buildings in the compound. The patients and their relatives (who assist with care) – as well as hospital staff – all have clean water for drinking, food preparation, and bathing 24/7. Safe, running water is so basic to good health, especially at a healthcare facility. If patients don’t have safe water to drink, and if staff can’t wash their hands, you’re going to see significant infection and illness rates. "On receiving my appointment letter as a volunteer Nurse at Kikuube HCIV I was thrilled. However, my thrill was turned into disgust, discouragement and regret on my first day of work. As a volunteer midwife, I attend to mothers in labor, those who have given birth, and new born babies. Due to their vulnerability and high risks of infections, I must exercise high levels of infection control to protect the mothers, babies and myself. This meant washing of hands in between patients, cleaning and disinfecting equipment and surfaces and good personal hygiene of mothers, care takers and the babies. On that fateful first day in the dry season, the only rain water harvesting tank attached to the maternity ward was empty with no single drop of water. The maternity ward was unbearably stinky and uncomfortable! Some caretakers carried water from a nearby borehole, others would keep the dirty linen only to be washed on discharge while at home as such the stench in the maternity ward was excruciating. For a moment I wondered whether this was a place for saving lives, or putting lives at risk! 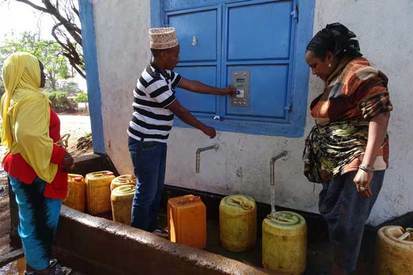 Months down the road, World Vision rehabilitated the existing non-functional piped water system in the healthcenter, connecting all wards and every critical point of care. My job is so enjoyable now because there is plenty of water to wash hands, equipment and work surfaces and floor. Mothers and caretakers, too, have no more excuses to store dirty linen; as such there is better personal hygiene and the ward is clean hygienic and smells good! My regret is no more! Thanks to Food for the Hungry, a USAID Food for Peace partner, Dinkie received training on horticulture and fruit production and the project helped her construct a hand-dug well with a rope pump. This well is at the center of her ability to cultivate nutritional vegetables on arable land. She diversified her crops with seeds provided by FH -- tomato, Swiss chard, potato, cabbage and apple seedlings. Now she’s harvesting three crops per year. One harvest is still fed by the rains, but the other two are fed with water from her well. She’s feeding her children nutritious food, and earning extra income for clothing and school supplies by selling her seasonal vegetables. She’s been able to retain her remaining livestock and even improve her small home. Mr. Sevu Kanyasya and his 6-year-old daughter, Wuyua, plant seedlings in their garden in Makueni County, Kenya. Sevu is able to farm and irrigate his fields in this arid county thanks to Lutheran World Relief’s WATER (Watershed Approach to Enhance Resilience) program. This system provides water access to Sevu’s family and more than 1,800 other households in the region. Akianne is a 68-year-old widow who lives alone in a remote area of Haiti. Although, she has a latrine, it is in very poor condition. She explains that most people in her community do not have latrines and they use the outdoors instead. This practice led to an outbreak of cholera, putting many in danger. Despite her age and poor health, Akianne must walk for two hours just to reach a community well. The journey is challenging, with steep climbs and rocky terrain. Returning home is always more difficult with a heavy container of water. 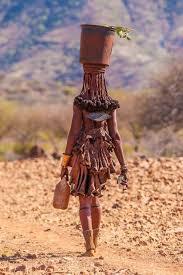 Akianne often leaves her home before the sun rises to avoid long lines and to reach the well before it runs dry. She knows that the water she brings home will likely make her sick, but she doesn’t have money to treat it. But her biggest worry is that someday, she will not have the strength to make the journey. Namata is 12 years old and lives in a remote village within CMMB's CHAMPS program in Zambia. She is one of 66 students who walk three miles to school each day – often after hours of morning chores. Namata’s teacher explains, “Lack of water and sanitary supplies has a huge impact on these girls. The tragedy is that many of them will decide to drop out of school and never return. Hers is one story among millions that don’t make headlines like the violence perpetrated by ISIS or the Taliban or Boko Haram. “I vowed not to tell my family, because it would bring shame to them. I took the water home and didn’t tell my family anything. I couldn’t trust the police, because they will not help me. I have to live with this shame for the rest of my life. I still walk to the pipe to collect water.